More than 120 Spartan race results this week! It was like a Spartan Stampede as 56 club members charged round the first Mid Week League race of the season on Thursday, but it wasn’t only runners as like a scene from Rawhide several middle distance cows joined in the race at one point. ISABEL GREEN reported the Longhorns were going the same speed as her. The 9.65 kilometres course in Epping Forest was very hilly and partly off road. Some runners were reduced to a walk the second time up Strawberry Hill but DAN McALPINE flew round the six miles to be the fastest Spartan and 16th overall in just 34 minutes 30 seconds. The next Spartan in was SIMON JACKSON who improved his previous time by 16 seconds to finish 24th in 35:22. Ten more Spartans finished in the next seven minutes – STEFFAN FORD 28th in 35:42; KEITH COUGHLIN 39th in 36:10; RICHARD SPRINGALL 57th in 37:43; TODD GRAY 61st in 37:52; JENNY PENNELL 71st in 38:42; STUART ARCHER 78th in 39:14; DANNY SCANLON 94th in 40:27; TIM SABAN 97th in 40:46; DEAN CARPENTER 105th in 41:15 and NICK GILL 126th in 42:15. MICHELLE REEVES led in a strong contingent of Spartan women. She was 151st overall, 22nd woman, in 43 minutes 20 seconds. Seven more females from Fairlands came in within eight minutes. They were Ashley SCHOENWETTER (44:05); Ruth REILLY (44:27); Claire EMMERSON (45:07); Isabel GREEN (47:00); Joanne BOWDERY (49:06); Kelly EVANS (51:09) and Jenny GARRETT (51:19). The other side of Chingford in time for a 7.30p.m. start after work was a real challenge for many Spartans and it was great to see so many made it. The next league race will be in St Albans on Thursday 24th May. It was a Spartans 1,2 at the first annual Hitchin 10k and first place for the ladies too! CALLUM STEWART won in 33 minutes 58 seconds with DAN McALPINE second in 35:18. NATALIE LAWRENCE won the women’s race in 39 minutes 54 seconds. They were all first in their category but those prizes went elsewhere as they were awarded the podium prizes. Eighteen Spartans took part. TREVOR BROOM was over the moon to finish in 1:02:57 which gave him a 16 minute personal best (PB). A great training run for his first half marathon in Edinburgh in two weeks. Spartans at the Hitchin 10k were as below. Fifteen Spartans had a great time at the Greenway Challenge Half Marathon on Sunday morning. After three finishers under two hours many arrived in two stripy waves. ANDY PATTERSON was fourth in 1 hour 17 minutes 57 seconds; TOM SAUKA 31st in 1:40:27 and JIM BROWN 88th in 1:52:56. The first Spartan wave was ISABEL GREEN 156th in 2:05:00; TIM ROBINSON 157th in 2:05:08; PAUL WHYTE 158th also in 2:05:08; and SOPH GEORGIOU 166th in 2:05:23. A Spartan super seven were enjoying a social training run including a scramble for sweeties by one of the Spartan volunteer marshals with about two miles to go. They were CLAIRE EMMERSON 227th in 2:21:45; club chair SOPHIE COWAN 228th in 2:21:45; SUE HAMER 229th in 2:21:46; HAYLEY YENDELL 230th in 2:21:46; ROBERT WRIGHT 231st in 2:21:46; JENNY GARRETT 232nd in 2:21:47 and JULIE SHADBOLT in 2:21:47. VICKY COTTOM came in soon afterwards with 2:27:43. Last May Michael Andrews and his wife to be Aimee ran the Silverstone 10K as their first race in their preparation for the Disney Marathon that they completed this January. Michael completed the 10k in 1:04:22 and Aimee ran round with her dad Paul Holgate in 1:12:48. One year on the three returned to Silverstone where Mick improved his time by 10:04 to 54:18 and Aimee & Paul knocked 6:38 off Aimee’s time to 1:06:10 setting them all up very nicely ready for the ‘Castle to the Chateau’ challenge that they have entered in Disneyland Paris this September. Michael Andrews 1008th in 54:18; Aimee Andrews 1496th in 1:06:10 and Paul Holgate 1497th also in 1:06:10. There were 1657 finishers. NEAL MUGGLETON ran the lumpy Alley Palley 10K in north London. He was second in his age group with 53:08. His height gained during the race was 799 feet. CAROLINE BARTER did the Royal Parks Summer 10km at Greenwich Park. Another hilly event which she finished in 50:58. She was third FV40. It was the Gatwick Half Marathon on Sunday for NICOLA FINNEGAN. She said it was a fair way off her PB at 2:44:17 and not the time that I wanted, but after a week of encouragement from FVS this week, she had a really pleasant run and was ok with it. Nice medal, selfie at every mile marker and high fives from Susie Chan, Sally Gunnell and Colin Jackson as she crossed the start! 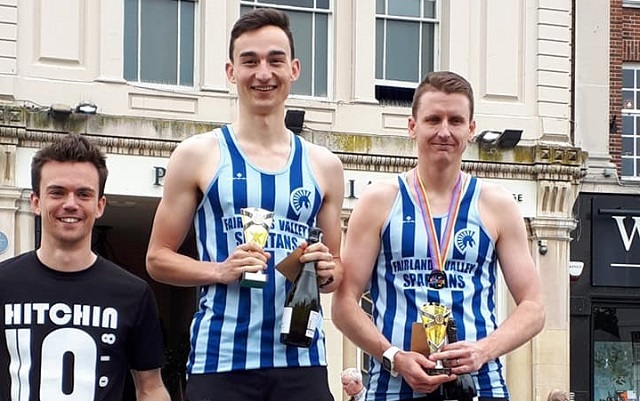 In his fifth race of the week, Spartan Paul Holgate was pleased to take 12 minutes off his 2017 time at the Shakespeare Marathon in Stratford upon Avon to finish in 5:14:15 – his fastest marathon since November 2014. Another Spartan also running his 5th race of the week was Michael Andrews completing the Marlow 5 miles in 40:45. ANGIE KEELING enjoyed the Hertford 10K and broke the one hour barrier. Saturday’s parkruns saw FVS turning out in force in England and Eire. Close to home in good old Stevenage 14 Spartans ran the 100th Stevenage Parkrun. The cake at the end was very welcome! There were PBs for Sheryl HANN (29:00) and Niki PLUMB (33:34). Danny SCANLON was first Spartan man in 19:49 and Karen PALMER was first Spartan lady in 25:49. In Enfield Tim Robinson ran at Grovelands where he finished in 24:58. In Letchworth, John ROXBURGH finished in 15th position in 22:10. Nick WITCOMBE, in his comeback for Edinburgh half marathon, ran Letchworth Parkrun in 31:39. Both were first timers at Letchworth. At Ellenbrook fields parkrun in Hatfield Barry OSBORNE ran 20:05 for 17th position overall. Further afield Hannah NEALE took on the Bath Skyline parkrun and finished sub 25 mins in 24:46. In Tonbridge Michael O’KEEFE joined a huge field of 642 runners to finish in a time of 29:21. On the island of Ireland Paul MCGUIRE ran a new PB of 22:45 at Naas Parkrun held at Naas racecourse west of Dublin.